I was the morning announcer on WACO radio Aug. 4,1952 when one of Waco's biggest and most tragic stories broke: Two Greyhound buses had crashed into each other just north of Lorena. In those days, if you were a radio announcer, during your shift you were the newsman, the weather man, the sports man and the DJ who was spinning the records. weather, sports and news from Porter Randall and Paul Harvey. That morning our phones were ringing off the wall. Other radio stations were calling wanting news reports on the crash just outside of Waco. I knew nothing about the wreck but found information on the Associated Press news wire. The buses had run into each other just outside of Waco about 4 am. One had just left the Waco terminal. The other had just left the Temple terminal headed for Waco. Throughout the day, as news bureaus and radio stations learned of the tragic event, in which 29 persons had died, and 23 injured were injured, everyone was calling for on-the-scene coverage and live reports. The station was feeding live reports all day. ABC Network arranged for a live two-minute feed at 6 PM and I learned that I would be the voice to do the live broadcast on ABC Evening Newscast. I began to look for late-breaking news on this tragic event. I went to Compton's Funeral Home at 11th and Austin, where a make- shift morgue had been set up in the alley behind the funeral home. In the alley were hearses and forsenics investigators, police officers and and many figures on stretchers. I remember the odor of burned bodies. We learned both drivers had been killed. Both were Waco residents. Being on ABC News and giving a report to the entire country about this terrible event was pretty scary and I did receive a $25 check from ABC for my national debut. 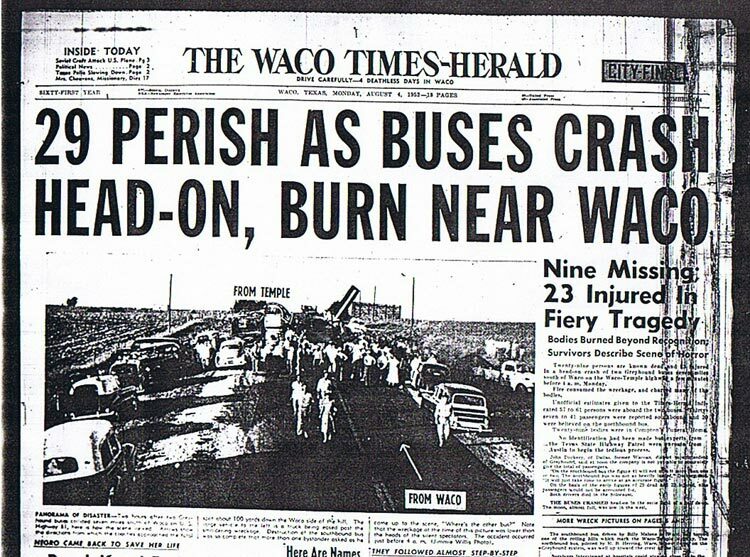 The Waco News-Tribune carried a riveting account of the crash written by Reba Campbell.